Two upcoming utility construction projects, a coordinated effort between St Paul Regional Water Services ( SPRWS ) and Xcel Energy, are expected to begin late April and May of this year. 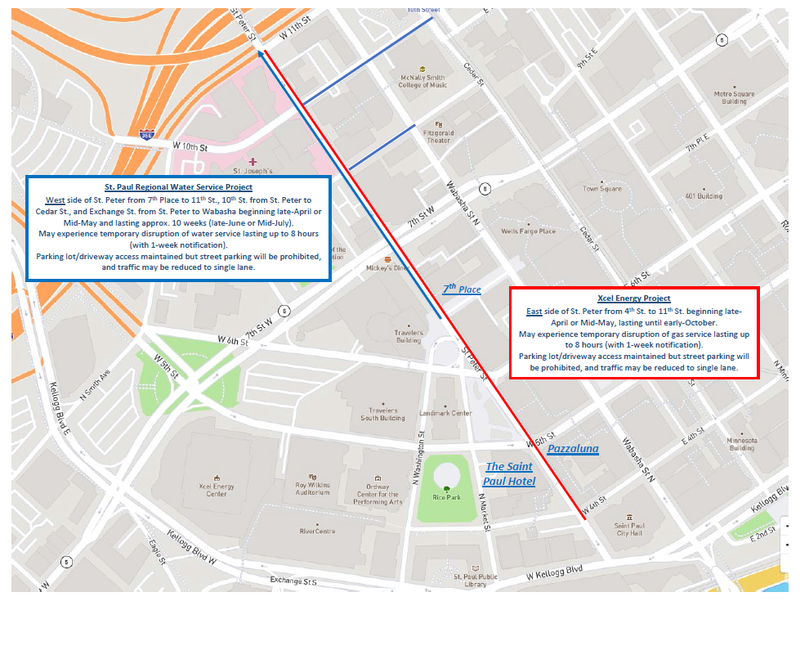 This work will take place primarily along St. Peter Street, from 4th St to 11th St and on Exchange St to Wabasha Ave. For both projects, access to driveways and parking lots will be maintained, but street parking in work zones will be prohibited and traffic may be reduced to single lanes. The map below highlights areas that will be under construction. Two open houses will be hosted by both SPRWS and Xcel Energy, providing opportunities to ask questions about the projects. Both open houses will be held on the same day. Attendees will be able to view project maps and more detailed construction information. SPRWS water project –The existing water main located along the west side of St. Peter Street, under the roadway, will be replaced using a method call pipe bursting. This work will be conducted by SPRWS, and will begin at 7th Place and progress northward, ending at 11th Street. Work is expected to begin in late-April or mid-May, depending on weather. The work is anticipated to last approximately ten weeks. Xcel Energy natural gas project – The existing natural gas line, located along the east side of St. Peter Street, will be replaced by open trench methods, allowing for the new pipe to be installed close to or in the same trench. The natural gas line work is expected to begin late-April or mid-May, and is anticipated to be complete in early-October. Please note that the project timeline is subject to change because of inclement weather or other factors.